When society as we know it collapses and zombies roam the earth, you could take your chances and pretend to walk amongst them, Shaun of the Dead-style. But let's face it, after a certain point, you'll be forced to take up a well-balanced diet of brains. 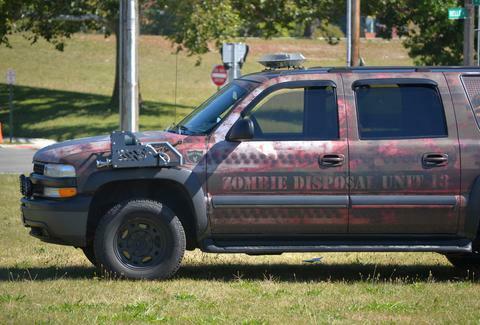 No, no, the far better option is to prepare yourself and your ride -- your stronghold and greatest tactical advantage -- for the zombie apocalypse in a way that guarantees you'll be impervious to the uncoordinated assaults of the undead. Here’s everything you’ll need. When looting and mass chaos ensues, you could have your pick of fancy-shmancy sports cars, but what good will a Ferrari do when the roads are clogged with hordes of skin eaters? 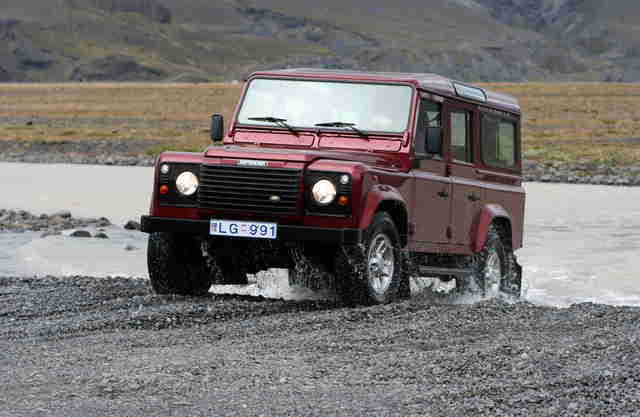 You need something that can go off road, and do it with aplomb. That means four-wheel drive and significant ground clearance (just imagine the piles and piles of carcasses, guys) like a Jeep, a real SUV (not a car-based crossover), or even a full-sized van, provided it’s a 4x4. Avoid trucks, though. If you thought hop-ons were bad on the Bluth Company stair truck, try dealing with decaying mutants in your truck bed. 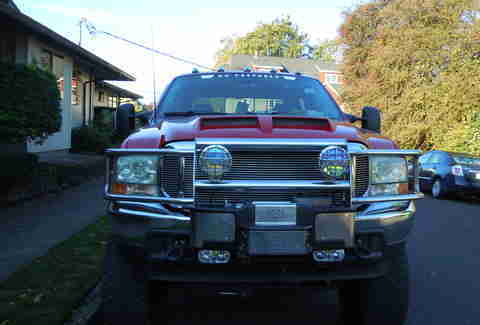 Also known as cattle bars or bull bars, their original purpose (before they became a trendy embarrassment for urban posers) was to protect the front of your truck and radiator if you collided with a cow. In the apocalypse, there are no cows, because zombies ate them all. Zombies are the new cows. Just in case your car gets stuck somewhere, you'll need a way to get yourself out. Provided there aren't 30 hungry creepers descending on your cerebellum at that moment in time, a winch is an invaluable tool. For years, several manufacturers have offered infrared cameras with in-dash displays so you can see objects in the darkness that you'd otherwise have no clue were there. When every second counts and the absolute last thing you want is a surprise encounter with a zombie at point-blank range, an infrared system is a seriously worthwhile investment. The contraption you see here was originally designed as an anti-carjacking device for use in South Africa. A system like this isn't exactly legal in the US, but in a zombie wasteland, all bets are off. Fire may not kill the undead, but it will keep 'em at bay long enough for you to make your escape. Worst case scenario, you can use run-flats, but they're not ideal for off-roading. 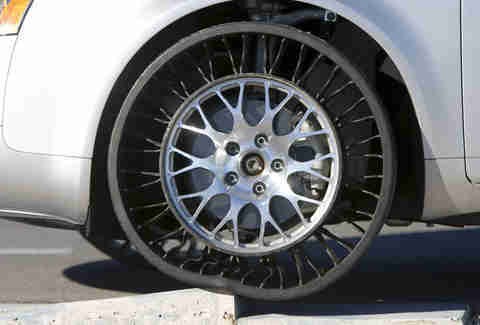 What you really want is a proper set of airless tires, like the Michelin Tweel shown here. They're cutting-edge tech that uses no air pressure whatsoever, so you're not going to get a flat at a really inconvenient time. Zombies aren't going to shoot at you, because that would be silly, right? But when you’re plowing through a particularly aggressive throng and rotting body parts are flying all over the place, you'll take comfort knowing that nothing can bust through your windows. 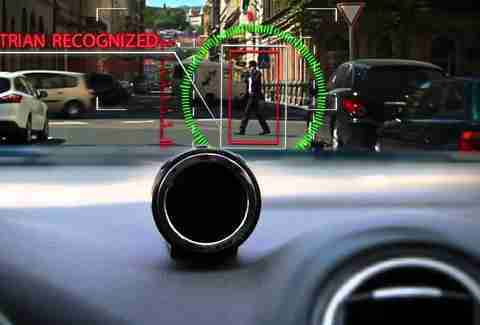 Companies like Mobileye (shown) provide high-tech systems that sound alerts when you're about hit something you probably don't see yet. It's technically a “pedestrian” detection system that warns you to slam on the brakes. But the same principles apply when there's a disgusting flesh mutant about to pop out and surprise you. Floor it and take that sucker out. If, in the course of events, you wind up with some unsightly blood and/or brain splatters on your interior, you'll want to clean it with a hose instead of scrubbing with your bare hands and risking infection. 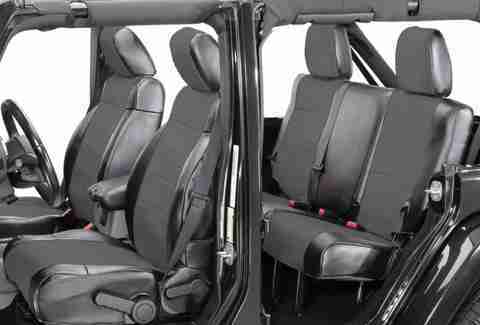 Vinyl seat covers are fairly inexpensive and are designed for people who take their 4x4 toys off-roading to get the mud off easier. Next, rip out the carpet and lay down a thick layer of the same stuff used for truck beds, and you'll be good to go! Aaron Miller is the Cars editor for Thrillist, and can be found on Twitter. When the zombie apocalypse inevitably happens, he wants to be the driver.